Forty11 Designs: Mixing It Up with Marabu! Mixing It Up with Marabu! Today here on Forty11 Designs, I am mixing it up with Marabu and the Designer Crafts Connection! 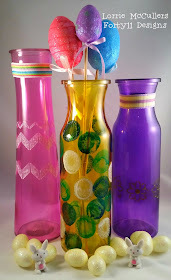 I'll show you how you can make totally cute painted spring vases using Marabu Porcelain and Glass Paint. 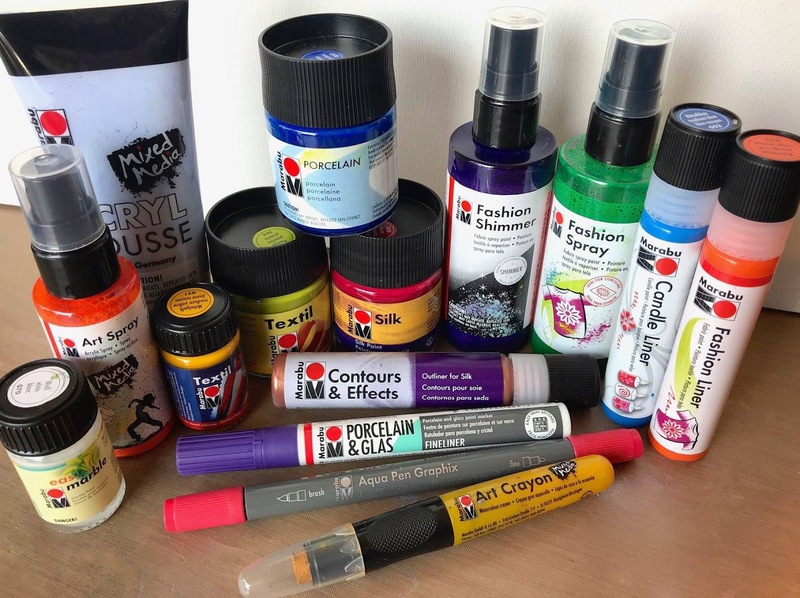 Marabu makes amazing color products for fabrics, mixed media, and more, but our blog hop is focusing on their porcelain and glass paints. These paints are highly pigmented, come in bottles and markers, and (the best part) are dishwasher-safe! 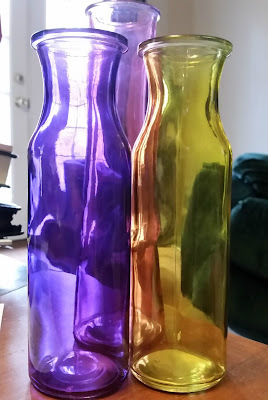 For this project, I picked up these colored vases at the dollar store (y'all know that is my favorite place for crafting materials). They had a lot of great colors, but I went with yellow, pink, and purple for a springtime feel. I made sure to wash them thoroughly so that the paint would have a clean surface to adhere to. 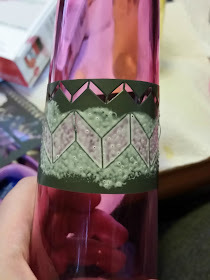 I then used an adhesive stencil on two of the vases (a chevron pattern on one and a flower pattern on the other), and applied the paint with a sponge paintbrush with a pouncing motion. 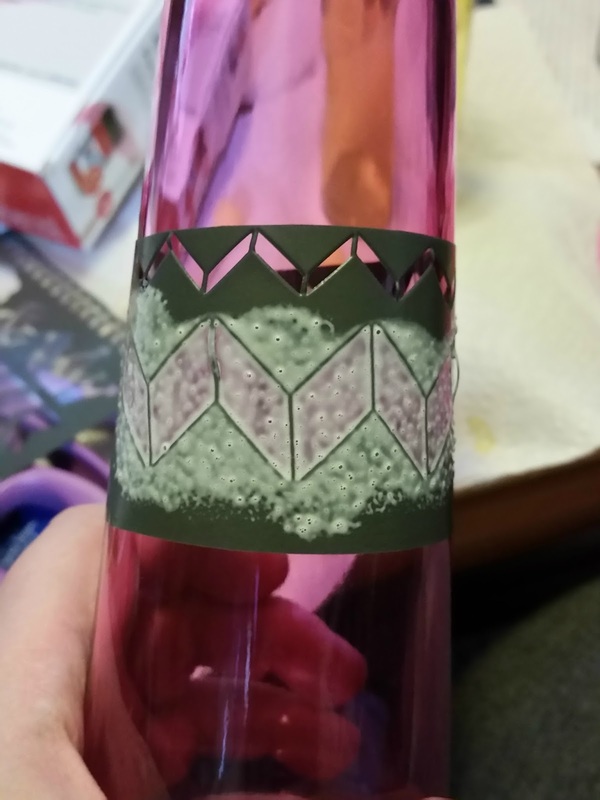 For the other vase, I went with a more free-hand approach. I made polka dots in white, blue, and green just using a round sponge pouncer. Now, I'm gonna admit something here... I totally forgot to take a photo of that process, but you can basically figure it out from the final photo! How awesome and easy is that? Just think of all the plain glassware from the dollar store that you can turn into cool custom pieces! 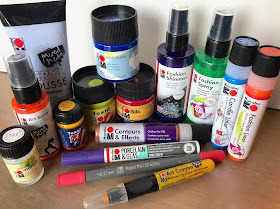 There are so many other ways to use Marabu Porcelain and Glass Paints and Markers -- just follow these links to the other DCC blogs in this hop! But that's not all! Marabu is giving away an assortment of their products (retail value $75)! Just click here and comment on the Marabu post on the Designer Crafts Connection Facebook page to enter. (This giveaway is open to U.S. residents only.) Good luck and stay crafty! Very cute and very easy! I have LOTs of stencils - thanks for the inspiration! great spring vases. perfect for Easter decorations. Love easy!! They look amazing!! how cute, love the colors! Thanks for the tip of using adhesive stencils with the paints. Nicely done! I have a jar like that, hmmmmm....now I know what to do with it! Love how those came out! Perfect for Spring! Craft designer and educator with numerous addictions, including obsessive reading, world travel, and saying "y'all".